Photographing wedding rings is often done with a specialized macro lens; in fact that's usually what we do. Occasionally we like to mix things up a bit, particularly if there's an interesting surface to use. This image was shot with a wide angle lens that has a very small minimum focusing distance, which allows us to get nice and close to the rings with a very shallow depth of field, but still include much of the surrounding area, which in this case is the palm frond fabric of the women's sitting room at Old Palm Golf Club in Palm Beach Gardens, Florida. 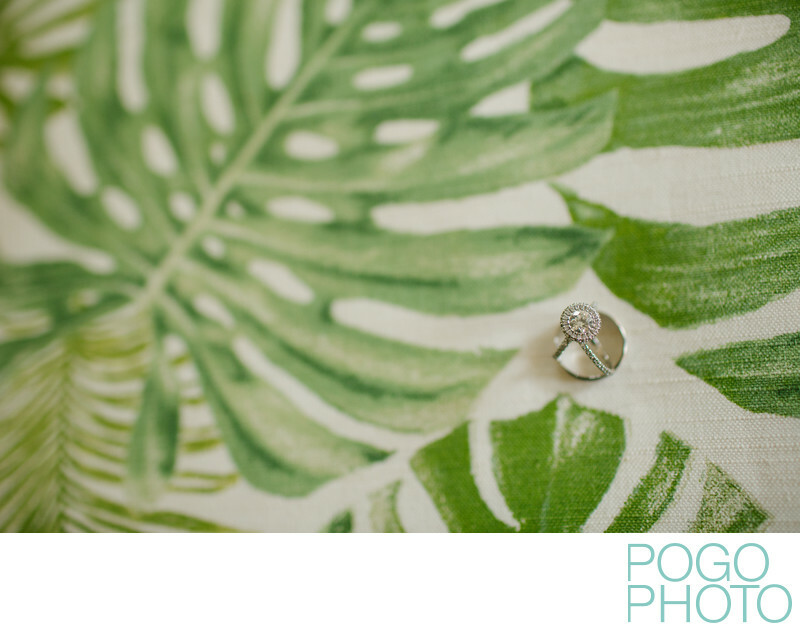 This pattern is decidedly Palm Beach in nature, and brings a classic "Florida Room" feel to the image that might have been overlooked if the rings filled the field of view. Embracing the natural surroundings of the getting ready spaces we work in is always easier when there's a lovely space available, and the airy, light filled front room of Old Palm's women's locker area is by far the nicest we've worked with. It feels much more like a private lounge for an afternoon tea than a traditional locker room (though there is one of those just around the corner), and the soothing palette of greens and warm whites provides a perfect backdrop for the morning's preparations. This delicate ring set focuses on a large oval diamond surrounded by smaller diamonds, a popular yet classic style that will stand the test of time. Location: Old Palm Golf Club, 11089 Old Palm Drive, Palm Beach Gardens, Florida 33418. 1/500; f/2.0; ISO 400; 35.0 mm.